One of the really fun things about my job is that I get to experiment with delicious food, and work with some of the brands that I admired for years. 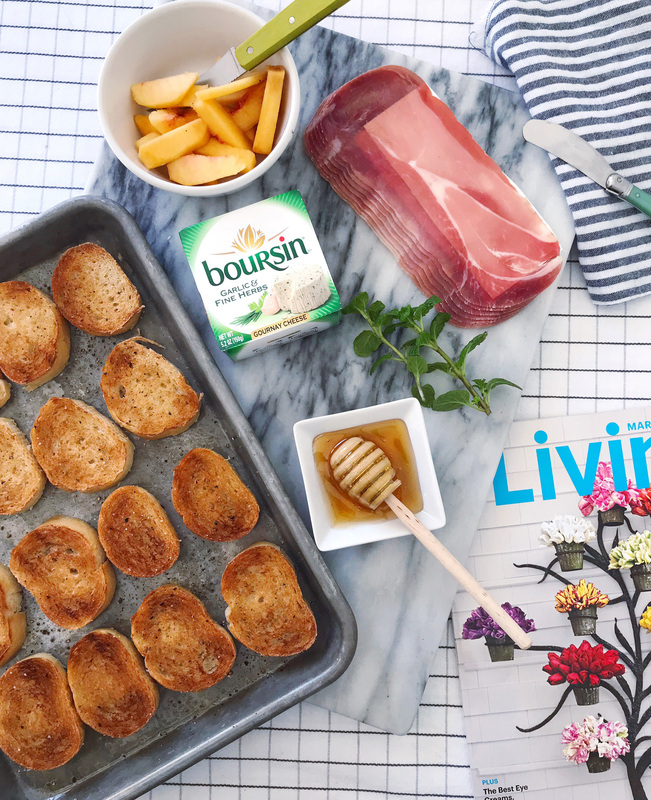 One of those brands is Martha Stewart Living, and I was so excited they invited me participate in a challenge this month to create an over the top tiny toast recipe using Boursin® Cheese that would wow guests when entertaining. I adore Boursin® Cheese, so this was a more than welcome challenge. The creamy, crumbly texture and decadent Garlic & Fine Herbs flavor are already one of my favorite treats — I actually love eating it on it’s own, and plenty of it was consumed in the testing of this recipe (I take my job seriously!). My tiny toast recipe came from balancing lots of sweet and salty flavors to balance the Garlic & Fine Herbs cheese, all while making sure there was lots of color to make the appetizer pop. To start, I toasted slices of a small baguette under the broiler; each toast was lightly drizzled with olive oil and cracked black pepper before heading into the oven. Then I spread the Garlic & Fine Herbs Boursin® Cheese onto the toasts while they were still a little bit warm. 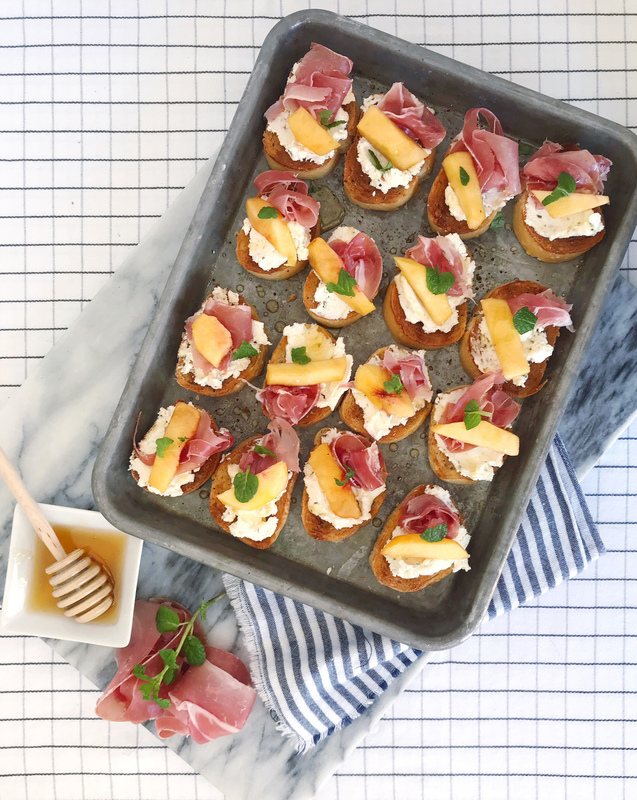 Each toast was topped with a thin slice of prosciutto and a small piece of a freshly sliced peach. I finished them off with a drizzle of good honey and some torn fresh mint leaves. 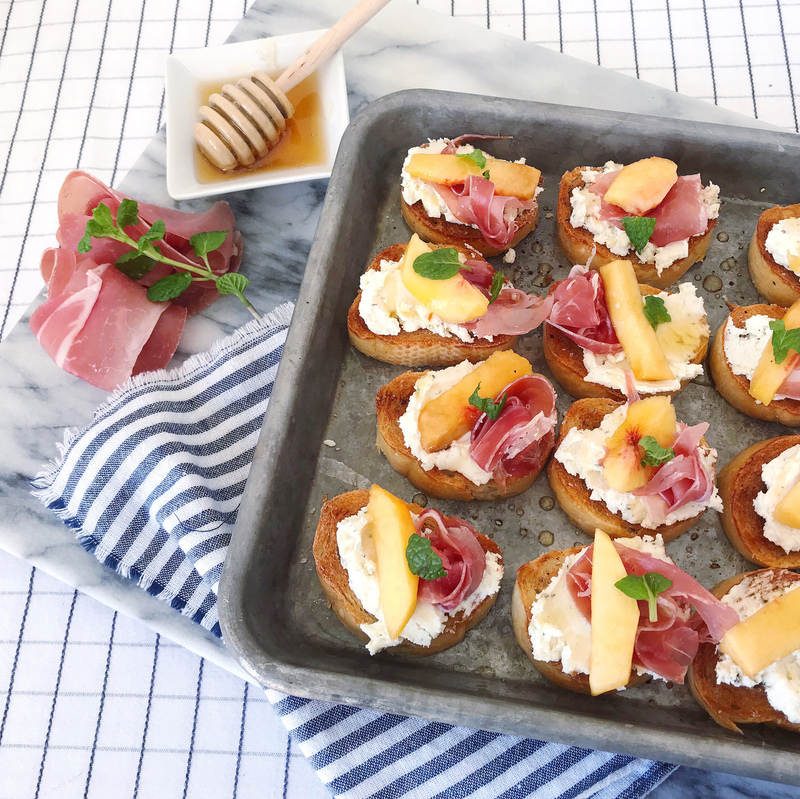 If you want to create a version of this without the toasts, to accommodate other food preferences, you could place a piece of the prosciutto, fill it with a spread of the Boursin® Cheese, a small piece of peach, drizzle with honey, black pepper, and torn mint leaves. Roll it up and secure it with a toothpick! I made these toasts and shared them with friends on a recent afternoon at home, and we gobbled them up – they were so tasty. In fact, I snuck one or two (okay, fine, three!) before my guests even arrived. They made a tasty little snack lunch while I was getting the rest of the food prepared. Get the full recipe below! Set your oven to the broil setting. While the oven heats up, slice the baguette into ¾” thick rounds and place on a rimmed baking sheet. Lightly drizzle the toasts with olive oil and season with freshly cracked black pepper. Toast in the oven under the broiler until golden brown, watching carefully to ensure they don’t burn. Remove toasts from oven and let them cool slightly. Spread each toast with Boursin® Cheese Garlic & Fine Herbs. 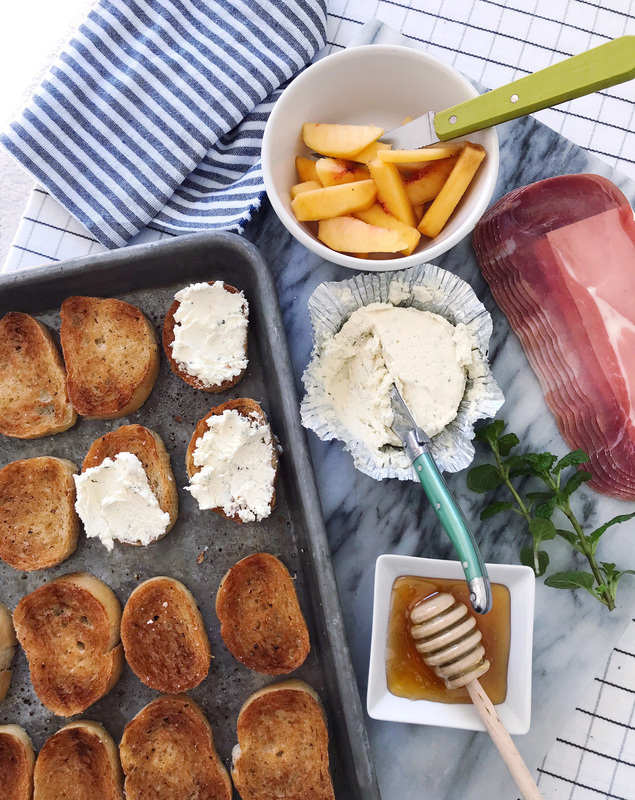 Add a half a piece of prosciutto and a slice of peach to each toast, and then lightly drizzle with honey. Top each toast with half a torn mint leaf and serve immediately. Please note: This post was created in partnership with Martha Stewart Living and Boursin® Cheese. All opinions, images, and content are my own. Thank you for supporting brands that support this site. Pantry and Prop Closet Organization. Living Room Makeover.